ATLANTIC— The Yew Town Council (YTC) held its first meeting on 19 June 1998, making it one of Atlantic’s oldest organizations. During the first two years of its existence, the YTC developed into a widely-renowned and well-respected establishment. Many of the Council’s governance and organizational practices influenced the foundations of other town councils. Sadly, on 4 May 2000, when the YTC was at the height of its influence, its predominance suddenly began to decline: an abrupt change to the facet system posed a challenge that the YTC was never quite able to adapt to. The YTC was not a guild, but a loose affiliation of likeminded guilds that collaborated to promote Justice, the virtue of Yew, and to encourage the betterment of Yew’s community. When Atlantic was divided into two facets, however, many of these guilds were forced to reexamine their respective missions. As members of the YTC began to evolve, some lost interest in the Council. Moreover, several new guilds began to pose an external threat to the YTC. In light of these changes, the Council’s leadership found it increasingly difficult to hold the community together. Presently, the Yew Town Council is only a shadow of its former glory but it is currently enjoying a resurgence under SunWolf who has resurrected the Militia and The Yew Town Council Meetings have moved to Yew Abbey Trammel. Meetings are held every 2nd Thursday at 9:00 pm EST. Guilds and Individuals are invited and welcome to attend. Any announcements or organizational events that might be up coming from any guilds may be announced at this meeting also. Despite the YTC’s regression, the Council remains an important part of Atlantic’s history. 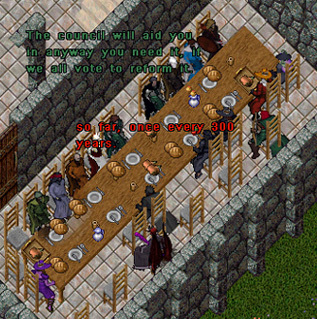 It’s legacy is a shining example of what many consider the Golden Age of Ultima Online . One of the Council’s central members, SunWolf, is currently working to redevelop the organization. Because of his centrality throughout the organization’s history, I asked him to tell his story of the YTC’s early years. Sometime around December 1998 or January 1999, I was in Yew and ran across a fellow decked out in a green uniform and armor. His speech was smooth and he really presented himself very well. I was curious about him so I just started asking a lot of questions. Later, I learned that he was a private in the Yew Militia and he was patrolling Yew to see if anyone needed anything. His name was Rabulkain and he would later on become Mayor of Yew. We said our goodbyes and I went in search of the famous Serpent Cross Tavern I kept hearing about. Probably a week or so later, the guild that was based in Minoc broke up, so I moved back to the town I enjoyed being in, which is Yew. I knew the people at West Yew University (WYU) and was one of the protectors of the place back then and aided in anything they needed. One night at Serpent Cross, there was an militia meeting which I was allowed to sit in and Renee, who was one of the bartenders at the tavern, was voted as the new Militia Captain. There was also an attack on the tavern, which I aided in averting. I had been fighting murderers a lot due to the old guild I was in, Covetous, Minoc Mines, and WYU. Rabulkain kept asking me to join Yew, because they needed someone who had some skill when trouble came. So I accepted and noticed they used WYU for training. There was around 12 or so active people who were always together, but they really had no skills in combat. I used to get yelled at by Renee about how I talk and presented myself, since all I knew was the PvP world. Rainbow King and a list full of others pretty much helped me along the way. It was a habit I had to break really, but once I started paying attention to what I was saying, I was promoted to Sergeant, which is a tactical office used to train members. There were three patrols a day and different people with rank would lead them. The patrols were also a test, in a way. Citizens used to report to us any murder activity or if anything else was going in during these patrols. We would also help people recover their bodies in Shame, but it wasn’t in our boundaries to actually go inside and unless it was pre-planned. Normally, we ended the patrol there and just camped outside the entrance until we all went our own ways. Thursdays at 9 used to be our weekly militia meeting, Sundays at 3 was the town hall meeting. At the town hall meeting, I meet Gargish Dragon, who had taken time to answer my questions about Yew. He was one of the founding members of the Yew Town Council and he taught me a lot about the Council. Renee stepped down as captain and Zenda was voted in. I was promoted up to second of command after settling some internal stalker mess that happened within the guild. Slowly, everyone kind of stepped aside and let me do my thing. I had read the original meetings of forming this guild and I sometimes wondered where these other guilds were and why they were not around, so I went to find members of them all and asked them. It was many months ago and everyone was in game back then, a month would seem like an year those days, because you were busy all the time. There was just one facet (i.e., Felucca), so there was always something going on and my schedule was always full. It had taken me a lot of time to build up trust in these guilds – they had their own rules, own towns, own people. But I made sure the militia patrolled their areas and remained visible, giving them a chance to meet each other. I also made sure, when patrols were in the LOA village, that they followed the LOA rules – that they didn’t intervene unless they ask for help and respect LOA’s wishes. Respect was – and is – the main thing I enforced in Yew. After some time and a lot of debate, the ties between everyone got closer and trust was built. LOA, Clan Moor, STC, WYU, UN, Fogwood, and a few more all started joining the council. I asked for an ambassador from each guild. Each guild had three votes on issues in order to keep things fair, due to LOA boasting 400 some members. Then Zenda stepped down as Captain and Silver Dryad and Seer Nikademus ask me to become the captain. I declined because I didn’t’ feel I was ready and it was a big job. Besides, as lieutenant I could have more time to do more things. The Captain rank went empty for 3 or so days before they asked me again – this time with Gargish Dragon, who I really couldn’t say no to – and I accepted. 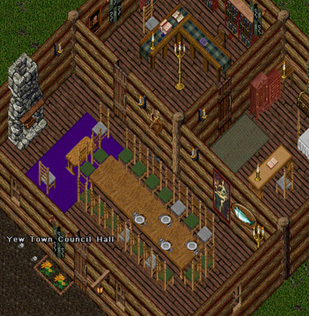 I kept the ball rolling, so to speak, and kept promoting the name and virtues of the Town of Yew guild, which consisted of only 7 active members due to the fact that we stopped recruiting after the aforementioned stalker problem. I met Xanthar in Serpent Cross Tavern. He asked the militia to be at the grand opening of the museums, and so we branched out into their own militia with the same basic uniforms as ours, but blue instead of green. Our numbers was spread thin and WYU formed their own militia. That didn’t last long and soon they merged with Yew to increase both of our numbers. No matter where we went, though – Rivendell, or Trinsic, or wherever else – we were well greeted and well known. The militia itself grew to around 48 active people, who all patrolled and helped out in Yew or wherever else they were called upon. Stormweaver Orcs started to appear and we had to keep them in check, as well. I had so many contacts and so many messages, I barely made it out of the office alive. Things remained like that for months. I sent groups of Militia to events, while I stayed working on what had to be done next. The ICQ messages killed me. I couldn’t play much anymore. People kept asking me to go meet this person and so forth. I even missed Lord British when he came to address us because someone needed help in Fogwood. After a few months, I worn down and asked my second in command to run for captain. He was voted in and I had departed Yew but stayed around as an adviser. Thrawn was the current mayor at the time and they both knew what yew was. I joined Knights of Sosaria, under Wolf and Breti, to spend more time with Gwendolyn of the Trinsic Council and Auren Therion of the Britian Council. I just wanted to have some personal time and enjoy myself. I attended all three of the council meetings when I was able, but soon trammel was formed. With the birth of Trammel, the Yew Town Council was as lost as everyone else. Many evil guilds appeared in Yew, as well. Yew had such a huge name, it seemed every guild in the world came after Yew and really spread things thin. It confused the current leaders of Yew and eventually new leaders were appointed. Regardless, people left yew little by little over time. The original feeling just wasn’t there. We went from helping people in felucca to just wars with evil guilds in trammel and there was really no reason for the wars, besides land. The battles in the past, prior to the existence of Trammel, with Ncr and Orcs all had meanings. Each group was fighting for a purpose, and even if it was for land. I was asked to return to yew to see what I could do to save it. I returned and people were happy initially, but I didn’t really have much energy left. I was still enjoying my retirement with Gwendolyn and seeing what Aurens would get into next. I think different people kept the town meetings going, the militia was pretty much there in name only. We had one last big battle which we won against BWK at Serpent Cross Tavern, but everyone pretty much departed after that. Everyone was heartbroken on how people acted or looked at Yew. The newcomers wanted to control Yew and do their own things in the city. Others came in and did what they did, and ran their own methods of the yew town council. I know nothing of their history or actions, but none of them were truly an open council, as Yew once was. Originally, the militia consisted of Yew citizens who were called upon to defend their lands, but everything seemed to change after Trammel. So, the militiamen returned to the woods, to whatever we were doing before we’d joined Yew, till the day that we all are called upon once again.